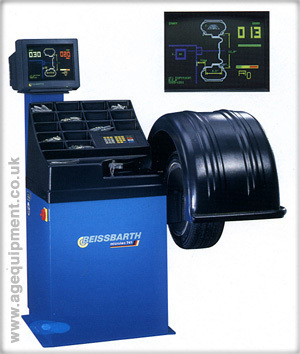 Model 741: Automatic measurement with wheel braking precisely at the balancing position. Monitor display of imbalance values. Automatic rim distance sensing. Memory for 64 different wheel rim types. Eight balancing methods. On-screen error code display. Matching program. Wheel sizes up to 20". Wheel weights up to 65 kg.